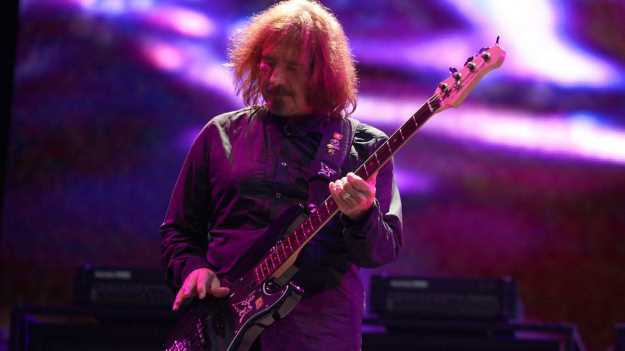 Geezer Butler: "Drugs never made me play better. 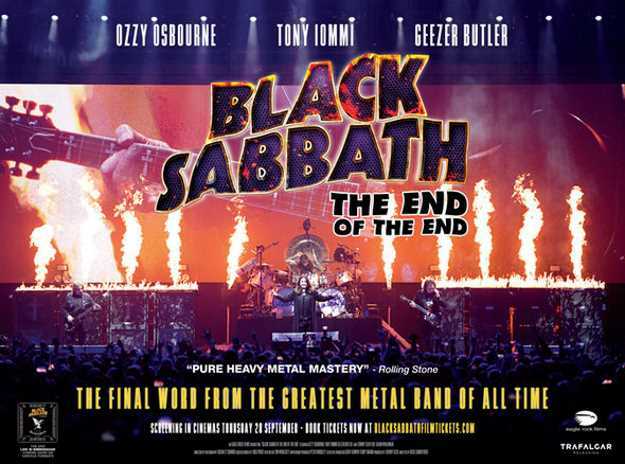 I'd think so at the time - then when listening to it back sober, I'd have to redo everything"
Recorded on the final night of Black Sabbath's farewell tour in their hometown of Birmingham, last year's live release The End Of The End couldn't have been titled any more fittingly - it truly marks the end of an era. What do you remember about Black Sabbath's final show on February 4,2017, Geezer? "I treated it like any other show in Birmingham. I'm always especially nervous there - it's the band's home town, our families and friends are there, and I can almost feel the fans willing us to be good. We're representing the city, so there's that little extra pressure. It wasn't until the encore, Paranoid, that I felt relief that everything had gone to plan, there were no technical issues and the band had played particularly well." The concert film also includes footage of you rehearsing after that last night. How did the idea come about? "I think that was Tony's idea. It gave us a chance to do songs that we wouldn't normally do in a set, or that had been dropped from the set along the way. Being in a small room again gave us a chance to talk about the final show, as we never had the chance to talk after the show, needing to spend time with our families and friends." What were you plugged into for this final run? "I had a number of basses with me. There was a Lakland P-style with split pickups, a J-style with P-J pickups, another white Lakland, a gold one, my Aston Villa FC bass, as well as my first prototype. These were going into an Ashdown amp custom-built for me, recently released as the Head Of Doom - which is a very serious amp for players who want more control of their tone. I have two cab models built by Ampeg and St. Louis Music, one is a double 15 and the other is a quad 12. And I use four of each on stage, housed in specially made frames!" Do all those basses have your signature EMG pickups wired in? "Yes - these are actually one of the first which EMG have made with the pole pieces exposed, which I like for the vintage look. The sound is also of a vintage nature, with a nice rounded highs, and a rounded bottom on the low-end, a scooped and boosted middle, for bass cut. "The pickups work great for all kinds of music and sound good with all kinds of string types - as I use 105s in D tuning and 115s in both C and C#, the latter of which are my signature series made by DR Strings and come in black." Beyond that, is it really just a wah pedal? "There's my own wah made by Dunlop, the Shure ULX-D wireless system with paddle antennas, my vegan straps - which, I might add, hold up to use better than real leather - and that's it." "It's amazing how well that first record [Black Sabbath, 1970] sounds - I think the bass sound on those early albums is what I strive to get back to... even now! But I think it's more about the feel and technique rather than the gear I play through." You were originally a rhythm guitarist in the Rare Breed with Ozzy. What were your first impressions of each other? "My first impression of Ozzy was that he was not the full shilling, as we used to say back then. I'd seen his 'Ozzy Zig Needs Gig' advert in the local musical instruments store and noticed he lived a few streets away from me in Aston. I went around to his house, but he wasn't in. "I later switched to bass when we joined up with Tony and Bill. At that time, we were a six-piece, there was already another guitarist and a sax player - so I switched to bass, being the least proficient guitarist in the band." And before you owned an actual bass, you used a detuned Telecaster guitar. "When we started rehearsing, as the Polka Tulk Blues Band, I tuned down my Telecaster and used it as a bass. I can't imagine now what that must have sounded like; the rest of the band must have had great patience! I borrowed a bass on the way to our first gig from the bass player in the Rare Breed. It only had three strings, but it was a damn sight better than using the Telecaster." You learned how to play very quickly. "I don't class myself as a great bass player, but I do credit Tony and Bill with providing the inspiration for me to play as well as I can. They were and still are very accomplished musicians. I can only thank them for having the patience and giving me the encouragement while I was teaching myself to play bass. I think the biggest mistake is trying to do too much too soon." You've often cited Jack Bruce as a primary influence. Is that why you've always bent your strings more like a lead guitar player? "Cream were my favourite band to see live; they were great musicians and I loved their albums. I saw them every time they played in Birmingham, three times in all, and I actually had a drink with Clapton in the bar at the Swan in Yardley. This was before Sabbath, of course, and I was just a fan at that time, so I felt very privileged to talk to one of my heroes. I loved watching Jack Bruce - I'd never seen a bass being played like that." And who impresses you out of the younger bands? "I really like Mike Kerr from Royal Blood. I think what he is doing is both innovative and listenable, which aren't necessarily mutual. I like the way he can build great songs around his basslines... brilliant." Which are the toughest Sabbath songs to play? "I've got to a point where nothing in the Sabbath catalogue is challenging for me, at least that I can think of. The only tip I can give is to practise as often and as much as possible, and have patience. Nobody is great from day one." Have you always played fingerstyle? "I used a pick on some of the GZR solo albums to give a more aggressive feel and sound to the songs, which were themselves very aggressive in nature. Some of the songs, such as House Of Clouds, were so fast that I couldn't get clarity using just my fingers - so I went with the pick." Which were the wildest recording sessions for Sabbath? "We only started using drugs while recording Vol. 4  onwards. The first few albums were recorded reasonably straight, maybe a few joints were smoked. The serious stuff was imbibed when we recorded that one in LA... and then later on Sabbath Bloody Sabbath . None of it made me play better. I'd think so at the time - then when listening to it back sober, I'd have to redo everything. Alcohol is by far the worst for performing. I only ever did that once, and that was enough." Now that touring with Sabbath is over, what do you plan to do with your time? "I will mainly be spending time with my family, dogs and cats - and probably doing lots of tourist-type travelling. Of course, I'll be writing ideas for songs, which may or may not ever be heard publicly. I just enjoy experimenting in my home studio." There is some good news in that Sabbath are still open to one-off shows in the future... If you were a betting man, when do you see that happening? "I'm totally resigned to the fact that Sabbath is over... except for its legacy..."
Basses: (all Lakland] Geezer Butler Signature (P pickups], Geezer Butler Signature (w/EMG PJ pickups], USA Series 44-51M ("Birthday"], USA Series 44-64 ("Goldie"], USA Series 44-64 ("Old #1"], USA Series 44-51M ("Aston Villa"], Custom/Prototype USA "EBOstyle"